Housing trends come and go but one thing remains constant: the kitchen is still the most important room in the house! It is the heart of the home where people still love to gather with family and friends. No matter how many rooms there are in a house, everyone still ends up in the kitchen. And of course, kitchens are what sell houses! I recently enjoyed a visit the Encore Construction showroom in Sudbury to see what's new and met with Award Winning Designer Nance Marshall* who graciously answered lots of questions so I could share them on my blog. I found Nance's insight very interested and helpful and hope you will too! What is the first question most people ask you about remodeling their kitchen? People are very concerned with the cost. A kitchen is the most expensive room in a home. What new trends are you seeing? White cabinets are still preferred. I urge my clients to be creative and get what THEY want. There really aren’t many rules, the kitchen should suit your family’s needs. Is granite still the most popular choice for counter-tops? What else are you seeing? Quartz is being used as much as granite, but for me there’s no replacing a beautiful piece of stone. I’m seeing lots of grey and white - what is the best way to add color without being too trendy? The trick is to keep the space “warm and inviting”. If you LOVE blue, find a way to use it. The backsplash is an easy way to bring in your color and personality to tie it all together. What is the most popular cabinet choice – white, dark wood, or other? Most are choosing White. Keep in mind there are MANY “whites” to choose from. We do encourage mixing in another color or wood. You can do the island in a complimentary color or wood, maybe a beverage area in another finish? You can also use different countertops in a kitchen to separate areas. 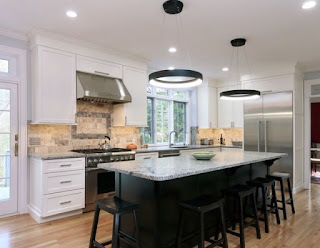 How long should people plan for their kitchen reno to take – complete makeover? Updating a few items? A full-blown kitchen down to the studs will be at least 3 months. But you’ll quickly forget the time when you’ve got a gorgeous new kitchen! It really is the most important part of any home. What is the most stressful part about remodeling a kitchen? For a family, it’s hard to be without your kitchen. It might be stressful for clients to make decisions that they all agree on. What is the biggest misconception people have about redoing their kitchen? Most can’t understand why it takes so long, but it does. Keep in mind a kitchen involves plumbers, electricians, carpenters, tile installers, countertops, painters and a ton of coordination. Return on investment is a consideration for renovation projects and if you would like a copy of the 2018 Cost vs. Value Report for Home Improvements please email marilynmessenger@realtor.com.